I was going to call this entry “Death Before Breakfast,” but I didn’t want to startle anyone. We found our beloved Betta fish Bob lying on his side on the bottom of his bowl yesterday morning. I choked back tears as I quickly carried the bowl into the kitchen so that Charlotte wouldn’t see the body. 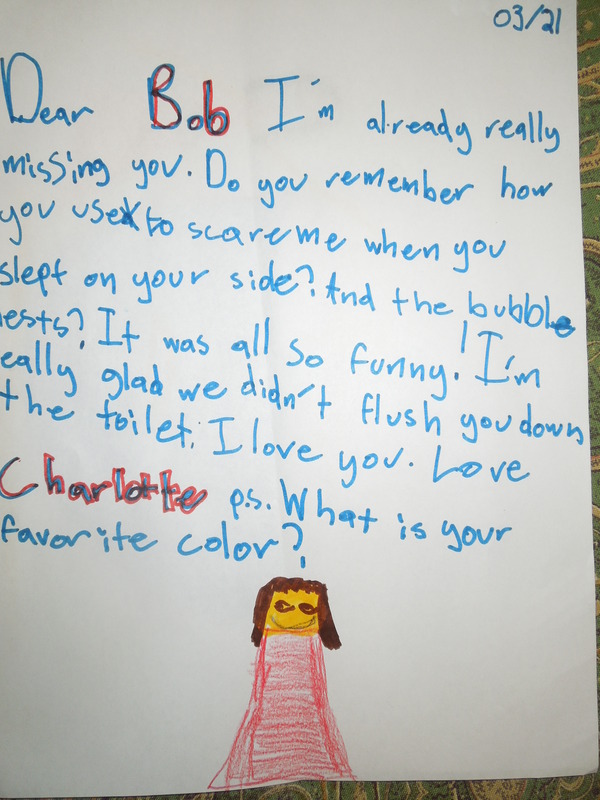 Charlotte’s first reaction was, “Can we go to the store today and get a new fish?” Then, realizing that while a new fish would be nice (and she still wants one) it wouldn’t be Bob, she burst into hysterical tears and was nearly inconsolable. She told me that at recess she told her friends she wasn’t in the mood to play. Instead, she sat in the corner talking to her imaginary friend Purple Bubba and crying a little bit. As Philippe wrote to me later in the day, this is both sad and awesome. Sad that our little girl is so distraught, awesome that she sought support, and beautiful that her school is such a caring environment. 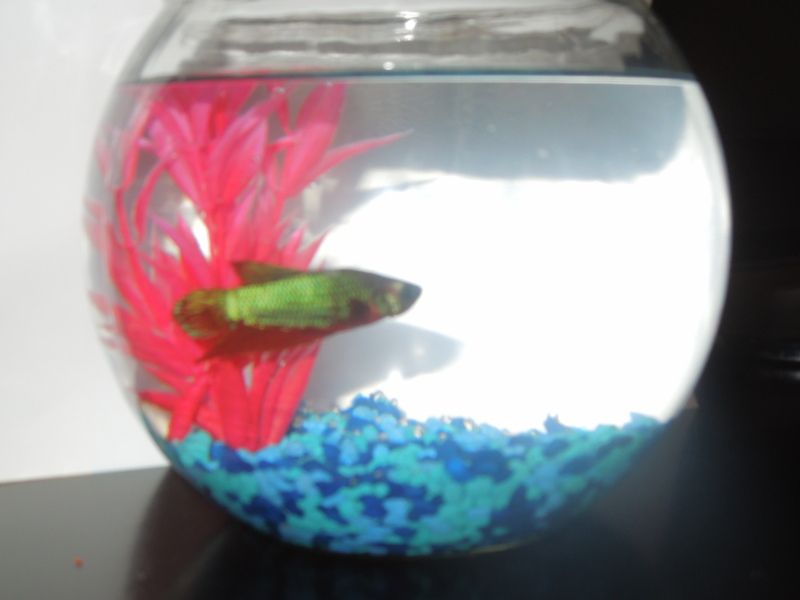 I loved Bob because he was cute and he was my first fish. It had been clear to me and Philippe that Bob had not been well for a month or so. He’d gotten lethargic, wasn’t eating, and occasionally had something dangling from his belly. On Saturday he started nosing around in his gravel. That behavior was odd and concerning enough that I had Philippe research what I meant. He found several articles stating that I meant the fish was trying to hide. We must not have read far enough because I now believe that Bob was looking for a place to hide so that he could die in peace. Bob was our compromise pet. We had discussed getting a tadpole for about a year, with the idea of releasing a bullfrog at the pond near our house in Arlington. Once it was clear that we were moving, I had reservations. First, I didn’t really want to move an aquarium cross-country (two cats was hard enough). Second, I was unable to quickly find out if bullfrogs are native or invasive in Illinois and we didn’t want to harm the ecosystem. We lit on the idea of a fish and Charlotte picked out Bob on her first day back to the Lycée. Dear Bob, I already miss you. Do you remember how you used to scare me when you slept on your side? And the bubble nest? It was all so funny!…. Philippe realized more than I did that in some way the fish was instrumental in her transition back to Chicago. He lived on her dresser in our corporate apartment and she talked to him daily. Looking back I wonder if he gave some kind of stability to that uncertain time (“Where will we live when we leave this apartment? Will our next home be?”) and made the plain, white room really hers. As we moved to our new house and lived (and continue to live) out of boxes, Bob offered Chicago continuity. And, perhaps, a feeling of control. She tried to be responsible for feeding him, but the beginning of the school year, with its increasingly heavy homework load, threw her off. In the past few weeks, she’d gotten better about remembering to do it. More than anything, Bob was Charlotte’s first pet. Sure, she has Miles and Esther, but they’ve been in the family longer than she has. Bob was hers—she chose him, she picked out his gravel colors and tank toys, and she was very proud of him. Often, she would leave Bubba sitting by his tank so they could keep each other company while she was at school. She was looking forward to celebrating her birthday with Bob looking on from the sideboard. Bob and Bubba share a moment. We were hoping Bob would have an average Betta lifespan and be with us for a year or three, and we’re all a little stunned. 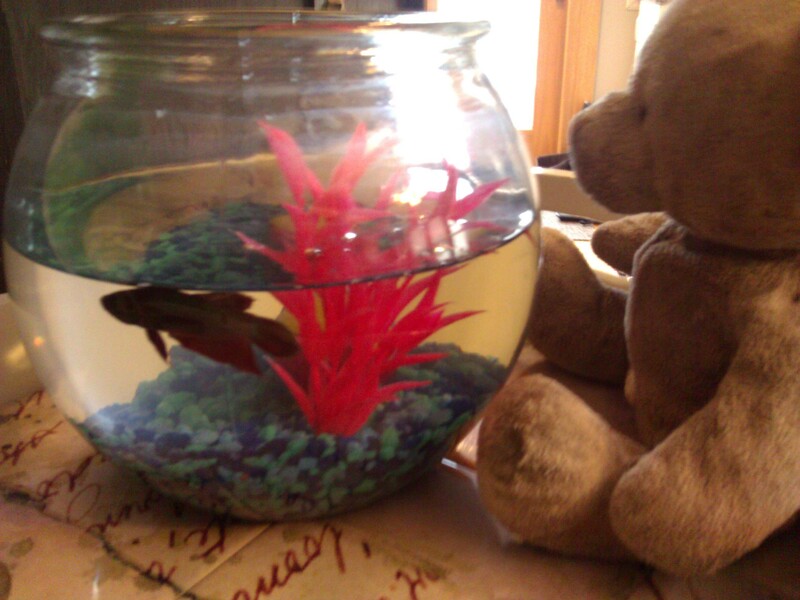 Phil and I feel helpless—we can take a sick cat to the vet, but what do you do for a sick fish? In some small way, this loss will have a silver lining eventually. Last month I accidentally killed Charlotte’s spinach plant (don’t ask!). Now she’s lost Bob. When our dear Esther-kitty leaves us, Charlotte will have had a taste of how hard it is to lose someone you love. And as much as we have our pets for their companionship and cuteness, as parents we agree that they are also instrumental in teaching responsibility and, sadly, loss. So, Bob, I hope you’ve swum on to deeper seas and are in some beautiful reef somewhere knowing that a little family in Chicago mourns you. And I thank you for all that you gave us, even briefly. As Charlotte knowingly said (paraphrased), the depth of her sadness is directly related to how much you put into her life. May your memory be for a blessing. Categories: Uncategorized | Tags: Betta, Fish, Siamese fighting fish | Permalink.